This years NeoCon event was a huge success! The industries top brands unveiled their newest creations for the workplace and showed that the world of office furniture is always evolving. That being said, one brand separated themselves from the competition and truly impressed. 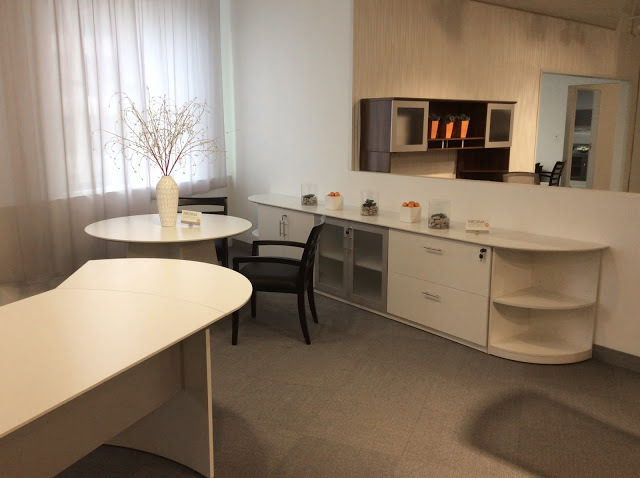 In today's post we'll take a look at all the awesome products Mayline showcased at NeoCon and what we can expect from this top rated brand in the coming months. Enjoy! Mayline kicked this years NeoCon event off with a bang by introducing the all new Sterling casegoods furniture collection. Set to release officially in the coming weeks, Sterling combines the modern design characteristics from trending lines like Medina and Napoli with white accents and outstanding finish options. The Sterling collection will include pre configured executive office furniture sets as well as conference room tables, storage solutions, and reception stations. We couldn't be more excited! The Sterling collection is poised to take the furniture scene by storm. Simply introducing a new office furniture collection wasn't enough for Mayline! This industry leader stepped up their game by introducing one of the coolest new chairs of the year. Mayline's new Living chair combines a fully functional ergonomic design with modern lines designed to impress even the harshest critics. These superb new ergonomic task chairs are great for workplace computing and professional meeting areas. With it's adjustable arms, polished frame features, and unique segmented spine design, the Living chair is anything but ordinary. Choose from a variety of stunning color combinations to let your design ingenuity and personality shine. Rest assured, the Living chair is set to revolutionize the seating world. We can't wait for it's official release! While Mayline is highly regarded as one of the world's premier office furniture manufacturers, the new Living chair is sure to put them in a league of their own. 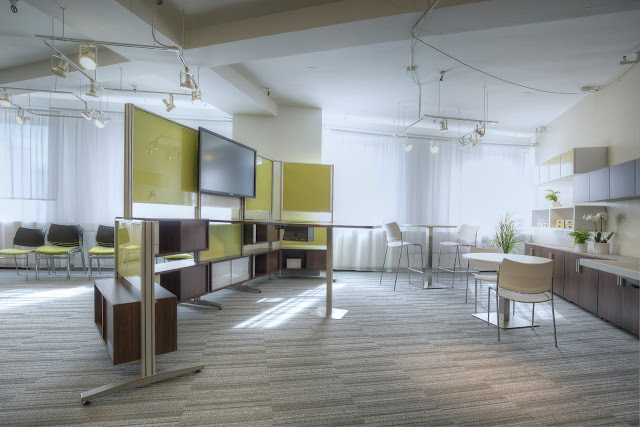 In the days leading up to this years NeoCon event, Mayline unveiled to their network of dealers that a long time favorite collection was being enhanced! The Aberdeen lineup of desks, reception stations, and conference tables is now available in Mayline's super trendy Gray Steel wood grain finish option. With the success of the new Medina line greatly attributed to this popular finish, making it an option on Aberdeen furniture was a must! At NeoCon, Mayline showcased just how great the Aberdeen collection looks in it's new finish. Room partitions are great, but if you're looking to take your interiors to the next level, look no further than Mayline's Keep wall system. This modular line of storage components and panels allows designers to create cohesive work environments designed around versatility and improved functionality. The Keep collection can be used effective in schools, training rooms, break rooms, waiting rooms, and conference room environments. 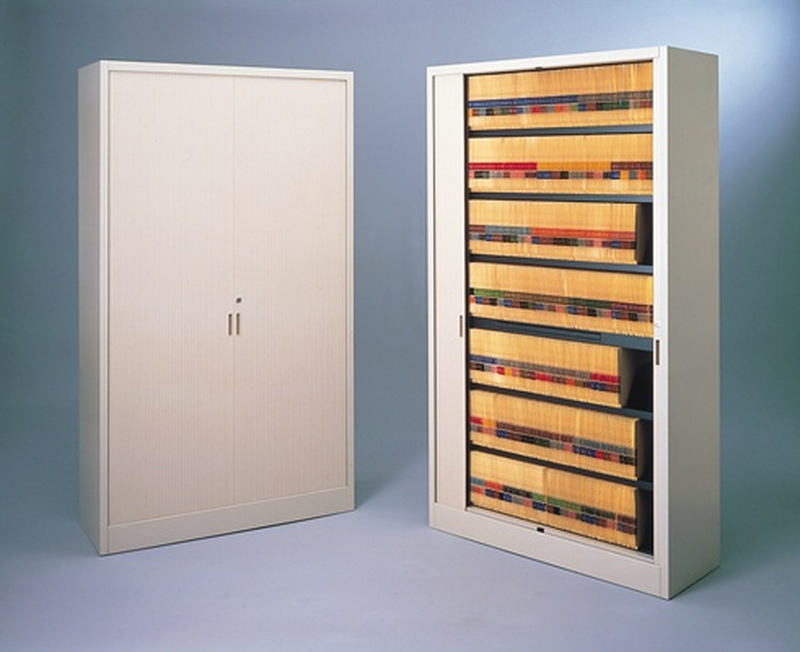 The wide array of Keep series components makes it easy to create a wall storage and partition system to work for your specific interior needs. Last but certainly not least, Mayline announced two cool new finish options for the Medina collection. While this popular furniture line has skyrocketed into super stardom the last few months, it's sure to enjoy even greater success with it's swanky new finishes. The entire line of Medina office desks and conference room furniture will be available in Sea Salt and Brown Sugar finish options before the end of July. Now that's exciting! If you're tired of the traditional cherry, maple, and mahogany tones, these new laminate options are a must see. The Medina collection is now ready to transform any office interior into a work of art! There's not too many good feelings that result from having your stuff stolen, but most victims will tell you: awareness that it can happen is better than blissful ignorance. Still, it's better to be safe than sorry. Because offices can contain a lot of data and vital statistics, they're one of the most commonly targeted places for burglars. Thankfully, today's article covers everything from cyber-security to old fashioned property defense, so you can rest knowing your workspace is still in working order! The internet may seem nice, filled with all it's hilarious memes and cat videos, but there's one menacing thing it's also filled with - hackers! And they can mean the death of a business. 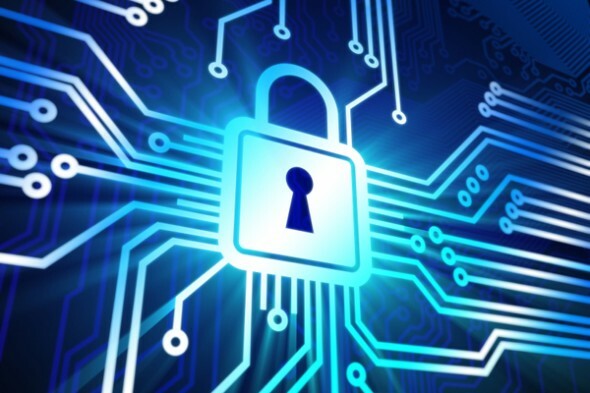 However, one way to thwart hackers from accessing your company's digital data is with crafty logins and passwords. While it may be convenient to use the same password for everything, that password ends up becoming a master key when left in the hands of a hacker. Ensuring your computer files and websites are secured with individual passwords is not only the best way to do things, but it's easier than you think! "Quality office furniture at prices you can't beat!" 5. But even a password this strong shouldn't be used for every website (remember what we said about the master key?) That's why slightly altering it for each site your company uses may help save you time and money should your business ever come under cyberattack. See if you can guess what websites these passwords go for! Of course, there are plenty of thieves out there who prefer to do things the old fashioned way, by physically stealing. And one of the most targeted places in an office are the cabinets! Burglars will look for anything of value, and since safes can be too much of a hassle, cabinets are the next best thing. Especially in places like doctors' and dentists' offices, file storage cabinets can harbor a wealth of identities and vital statistics. 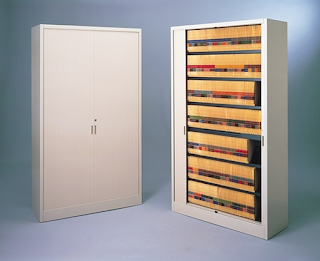 In order to ensure the safety of your company's clients and records, make sure to keep cabinet doors locked! Even if your company has the craftiest passwords on the planet, the most clever hacker will go right for the box - the computer box that is. The hard drive is a computer's brain and memory, and with a hard drive, its a lot easier to pilfer a company's information than it is to dig through the web trying to plant a virus. While affordable CPU holders are excellent space savers, and of course are super convenient for rewiring, most are unfortunately easy to steal. 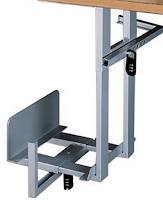 Thankfully, office tech companies like ESI Ergonomic Solutions and Symmetry Office Products have devised lockable CPU holders, which provide security and space-saving convenience all in the same package! 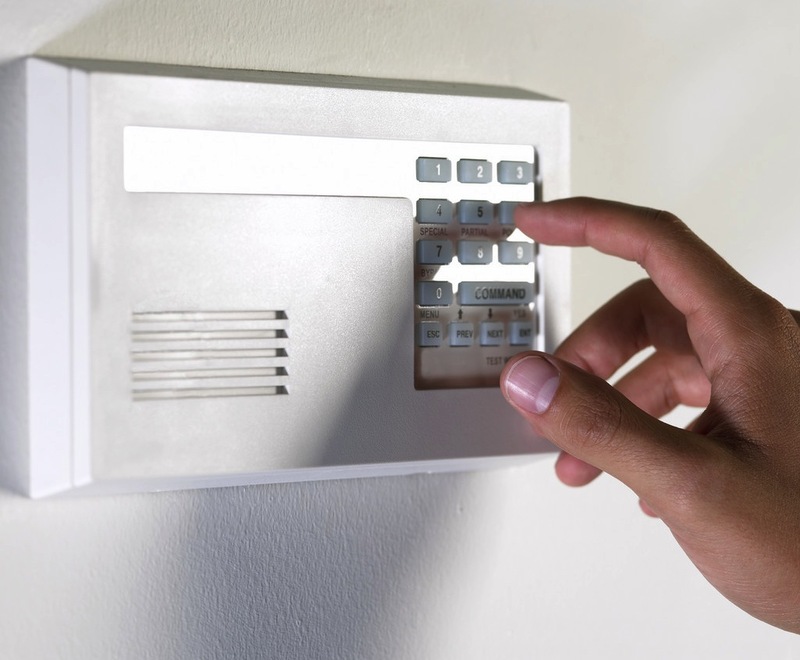 Nothing deters a burglar like a blaring alarm. Even if your office is in an area that hasn't ever been prone to thefts before, it's probably still worth your while to install a security system. This way your office is secured 'round the clock, even when the desks and cubicles are empty. On some high tech models, you can even punch in a fake signal code that turns off the alarm, but still notifies police so robbers think you're cooperating. Not only that, but most security systems nowadays are multi-purpose. In addition to saving your stuff from burglars, many of them also monitor dangerous things like smoke and carbon monoxide levels! Any good warrior will tell you, use your surroundings! For a burglar to burgle in the first place, they must be able to get to your things. Therefore, consider the physical landscape of your workplace. Are there bricks along the walkway, or heavy stones nearby? To some robbers, those things open just as easily as a key when tossed through a glass window. When all else fails, make sure to secure your workplace the classical way. 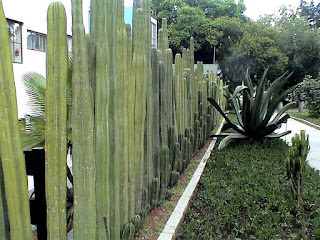 Build fences, plant cactuses, add gates, affix rail guards to windows that prevent entry - any of these things can help to slow down a robber! 7 Essential Office Chair Selection Tips for YOU! 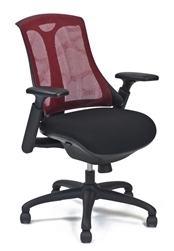 Looking to purchase a new office chair for your home or business? You won't want to miss the essential selection tips highlighted in today's post. Here we'll highlight just what to look for in a quality chair, as well as great ways to ensure you purchase the best chair for your specific needs and body type. Enjoy! Office chair comfort starts with the mechanism. Located underneath the seating surface, the chair mechanism acts as the brain of your chair. This important part controls about 75% of functionality. That being said, it's important to select an office chair with a mechanism designed to meet your specific needs. In 2015, syncro tilt and weight sensing mechanisms are the preferred options. 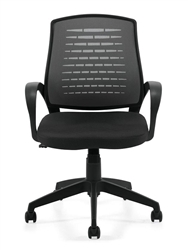 Before selecting your new office chair, take the back height into consideration. Chairs are typically classified into low back, mid back, and high back groupings. 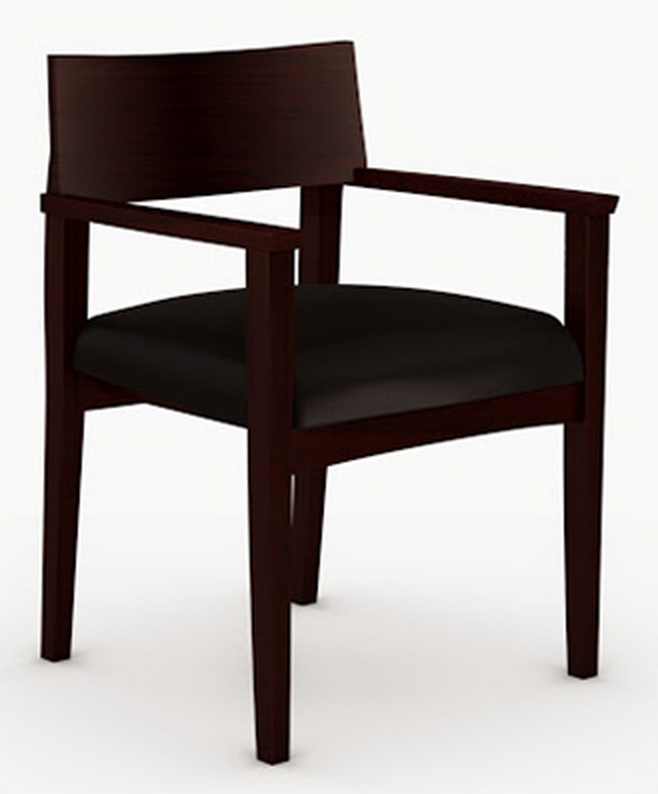 If you are over 6' tall, a high back chair is the way to go! 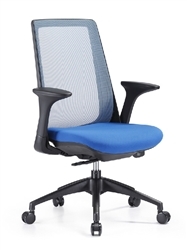 Shorter individuals can save on cost by shopping ergonomic mid back chairs and low back models. Expensive office chairs aren't necessarily the most comfortable. As comfort is completely dependent upon the specific chair operators preferences, it's important to not judge chairs based on price alone. While a chair like the iDesk Oroblanco by Cherryman Industries is $321.50 in 2015, it offers far more user friendly features than leather executive models priced nearly three times as much! If you're a larger individual shopping for a new office chair, it's absolutely essential to check the weight ratings before purchase. While normal office chairs are rated to accommodate users up to 250 pounds, it's still important to do your homework! If you need a bit more heavy duty option, try expanding your shopping search to include big and tall ergonomic chairs to ensure you find a model that's ready to meet your personal needs. Product reviews are widely available online to help shoppers make educated purchasing decisions. Take advantage of them! The Google Comparison Shopping engine will allow you to quickly find new computer chairs you're interested in and read reviews on them. Many of the top seating providers also showcase consumer reviews on their sites to help. Office chair providers have taken to sites like YouTube to showcase product demo videos that can be extremely helpful during the chair selection process. Take the time to browse for demo videos and watch them in full. 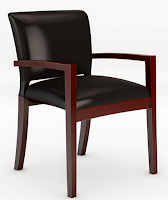 Helpful assembly tips, chair adjustment tips, and feature overviews are commonly available to help in the chair selection process. While a stylish chair may turn heads, the features will keep you comfortable. Once you've narrowed your search down to three or less options, make a list of the features each chair offers. Next, place a numerical value of one to ten on the key features you feel are most important. Last but not least, grade the chairs based on what features they have, and those they don't. This will provide valuable insight on what chair will be best for you. The Summer season has brought with it a variety of trending new finishes that really impress! With brands like Mayline and Global Total Office at the forefront of workplace innovation, creating stunning interiors is now easier than ever. 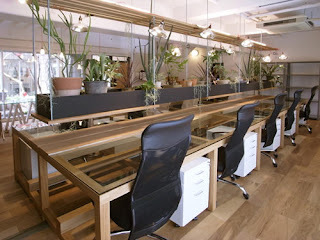 If you're considering an office makeover project, today's post is just for you. Consider these impressive furniture finish options and take your interiors to the next level! The all new Medina office furniture collection from Mayline has been a huge hit in 2015. With it's modern design characteristics and impressive product offering have contributed to it's rapid rise to stardom, the gray steel finish option deserves a lot of the credit! 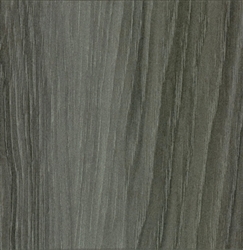 This attractive gray wood grain finish has become an instant favorite of interior design teams and industry professionals alike. White Chocolate is an exclusive finish from our friends at Global Total Office. If you're tired of the same old finish options, White Chocolate is a must see! 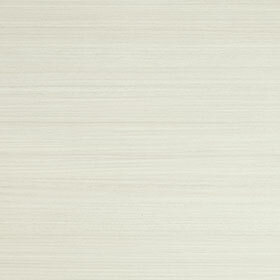 This impressive white wood tone can be used on a wide variety of Global's boardroom tables and modular workstations. White Chocolate is modern in every way and equally classy. Make your work environments stand apart from the competition with this trend setting finish option. The Verde office furniture collection from Cherryman Industries found it's initial popularity with it's espresso finish option. That being said, Latte has stolen the show in 2015. This lighter wood grain tone looks similar to bamboo! Latte desks and conference tables from the Verde collection work well for modern office makeover projects. This finish is truly unique and guaranteed to impress even the harshest critics. While traditional cherry wood grain tones will always have their place in the furniture world, darker options like black cherry have become incredibly popular this summer. Lines like the Cherryman Industries Amber office furniture collection boast black cherry options that should be considered for both modern and traditional workplace makeover projects. Another dark finish option that's enjoyed success this summer is Espresso. If you're looking for the perfect combination of modern and traditional appeal, Espresso furniture is the way to go. Reputable furniture brands like Offices To Go, Mayline, and Cherryman Industries all offer popular collections with espresso variations. You may also hear this popular finish referred to as mocha. If there's one thing professional business associates know, it's that leather looks good! For those in search of a sophisticated style for their workplace, the Mercado collection by Mayline seems to fit the bill. But are looks all they're cracked up to be? In today's article, we'll find out. 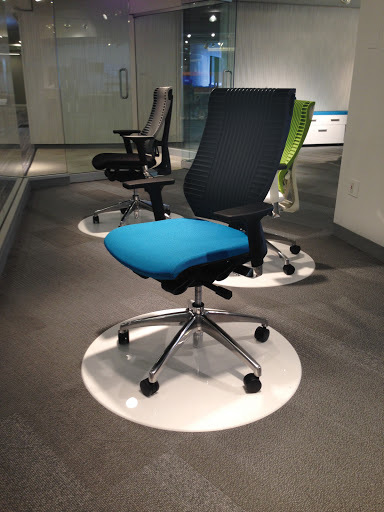 Presenting another installment of "Office Chair Reviews," here is our take on Mercado guest seating by Mayline! When it comes to style, Mercado guest seating by Mayline definitely has things down! Whether you choose the box-style chairs or the more traditional models, every chair in this collection is worth its salt in looks. Mercado relies heavily on the combination of rich dark finishing and glossy leather to create a classic professional allure. 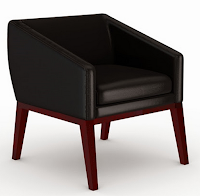 The perfect addition to reception area furniture and lobby applications, these chairs will draw visitors without a doubt, and the superb design will keep compliments rolling in. Talk about curb appeal! Although most contemporary visitor seating is purchased for looks than comfort, buyers of Mayline Mercado guest chairs will have nothing to fear from this line. Compared with similar models, Mercado seating is spot on for continued comfort. This is because the chairs are equipped with seat suspension for constant support. Of course, the genuine leather upholstery has something to do with the smooth feel of this seating line too. With a stunning leather finish on each model, users can choose from a variety of seat styles and still enjoy luxury. Compared to other office reception chairs, Mercado chairs are often a little more expensive. However, in comparison to other leather chairs for sale, they're still a bargain! Different models are offered at different prices, but Mayline also prices many Mercado chairs in packs of two, for convenience to buyers who may be trying to furnish an entire waiting room. The larger models are priced as singles. This way, buyers can efficiently shop according to business needs. One other thing the Mercado line possesses in spades is versatility! This collection offers a multitude of guest chairs in varying styles and models, of many different shapes and sizes, to meet a variety of applications. Not only that, but the Mercado line also includes a wide array of leather chairs for executives and conference rooms, so the whole office can match! Overall, we give the Mercado line 4.5 stars. What the collection lacks in pricing convenience, it more than makes up for in variety, comfort, and quality materials. Not only does the Mercado series feature expert craftsmanship, but the genuine leather upholstery speaks volumes for professionalism in business atmospheres. 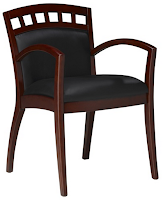 Whether for guests or executives, these chairs always deliver a sense of regality. Sophistication, elegance, and dignity - these are the characteristics of the Mercado series! How To Shop Smart for Your Next Office Desk! The office desk shopping process should be a fun and enjoyable experience that ends with an improved interior designed for productivity. That being said, in today's post we'll be highlighting the tips and tricks you'll need to shop smart for your next workstation. Enjoy! Before you rush out and buy a trendy new office desk for your space, it's important to effectively space plan. Start by obtaining the dimensions of your space and sketching them out on paper. Be sure to notate where power outlets, windows, and entry ways are located. Rest assured, skipping this essential step can result in purchasing a desk that doesn't fit, or work properly in your space. That's just not smart shopping! Educating yourself on the types of new office desks for sale on the market will help you make an educated purchasing decision. Product reviews and demo videos are widely available online to inform smart shoppers. Take advantage of these useful resources! While one type of desk may look great, it may not be the most practical option for your space. Check the measurements of all the new office desks your considering to make sure they will fit properly in your work area. With all the free shipping specials available online, it's silly to pay to have your desk delivered! Standard tailgate and loading dock delivery will ensure your desk makes it to your business at no cost to you. If you don't have a dock height facility, tailgate delivery will require you to remove your desk from the tailgate of the delivery vehicle and into your place of business. While free standard shipping methods can be widely found online, if you require additional services like inside delivery and installation, be sure to inquire about these charges before purchase to avoid any unnecessary surprises. Smart shoppers should know that even larger executive office desk sets can be delivered inside the first floor of their building for no more than $175.00. Going upstairs or an elevator will definitely increase the charge, so be specific when talking with your dealer of choice about your specific delivery requirements. Smart shoppers will always take the time to find a good coupon! During the checkout process, if you see an area to enter a promo code, stop! 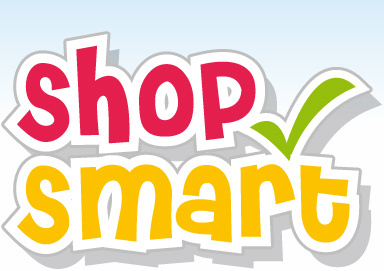 Open a new tab on your browser and visit popular coupon sites like RetailMeNot.com. Search for the website you're about to purchase from to see if current coupon codes are available. Often brands will provide excellent coupons for their best selling computer desks to earn your business. It never hurts to give your dealer a call to inquire about current specials. If you've got the time, you can even sign up for newsletters to alert you of monthly deals. 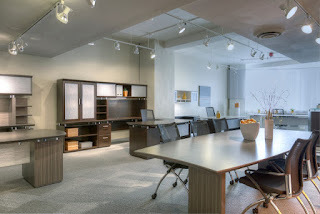 Reputable home and business furniture providers regularly provide additional savings to callers to earn their business. Don't miss out on this awesome opportunity by being in too much of a hurry to buy. A great bargain might only be a phone call away! Comparison engines are a great way to shop. We prefer Google Shopping as it allows users to sort products by price, brand, and style. It even allows furniture providers to post free shipping specials and coupons. Comparison shopping engines are incredibly easy to use and allow smart shoppers to quickly find what they're looking for. No need to bounce around from site to site looking for the best price. Comparison engines do the work for you! 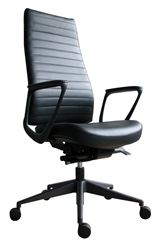 Cherryman Industries is known for their innovative office furniture and seating collections. This reputable brand takes pride in creating some of the best desks, reception stations, and conference room tables on the market. In today's post we'll be featuring the popular Amber collection and it's incredible products. 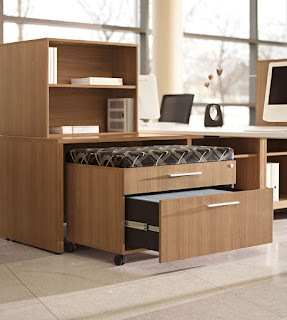 Rest assured, office furniture shoppers on a budget will love this awesome line! The Cherryman Industries Amber Office Furniture collection boasts a wide range of office desks designed to meet specific applications. L shaped Amber desks like the AM-331N feature peninsula shaped front sections designed to accommodate private meetings as well as wide returns for additional workspace. Amber U shaped desks like the AM-405N are ideal for executive home and business interiors. These versatile workstations offer plenty of storage space, as well as the modern appeal needed to impress important office guests. Taking on a reception area makeover project? Consider Amber! This best selling office furniture collection includes rectangular, L shaped, and U shaped reception area welcome desks designed for single and multi user applications. Amber reception desks can be enhanced with a variety of unique storage components as well as glass transaction counters to create that upscale feel your business deserves. Any interior designer and furniture specialist will tell you, it's all about going modular in 2015! That being said, The Amber collection offers super cool expandable conference room tables that are a must see. These unique boardroom solutions allow users to simply add or remove table sections as needed to meet the needs of any gathering. Popular Amber series conference room table models like the AM-410N are ready to meet your conference room needs for just $989.00. Now that's value! This 14' conference table is one of the best buys of 2015. They say no professional workspace can be at it's best without the right combination of storage components to get the job done right! Thankfully, the full service Amber line includes attractive lateral file cabinets, bookcases, desk pedestals and overhead hutch units to keep you operating nice and neat. The locking cabinetry from the Amber line will help you keep your important documents safe while offer far more visual appeal than those clunky metal file cabinets we're all too used to seeing in the workplace. Amber storage components can be purchased in executive furniture sets or individually to meet the needs of any project. Guest comfort is another key factor that must be considered during any office makeover project. While your space may look good from a distance, if it fails to provide your valued visitors with the comfort they deserve, you'll be left leaving a sub par impression. The guest, reception, and side chairs from the Amber collection offer shoppers the ability to compliment their Amber finished interiors without cohesive seating that doesn't lake in terms of appeal or comfort. These wood guest chairs are durable, stylish, and ready to make your interiors complete. The entire Amber furniture collection is available in 5 finish options. The trend setting black cherry finish is perfect for modern makeover projects while traditional finishes like cherry, maple, and mahogany are great for creating that classic look that never goes out of style. Last but not least, the Amber collection was expanded just recently to include the swanky new walnut finish option that's been a huge hit in 2015. No matter the furniture you need, no matter the finish you want, and no matter what budget you're up against, Amber is ready to help! 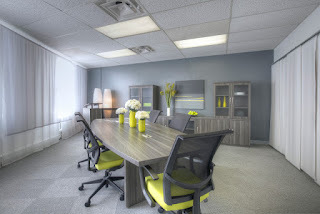 Looking to take your office interior to the next level in 2015? You're in the right place! In today's post we'll share 5 cool ways to decorate your workspace. From incorporating a trendy chair mat to adding innovative storage components, we're ready to help you give your office environment a serious style boost. Add a cool chair mat to your office space in 2015 to enhance both appeal and versatility. 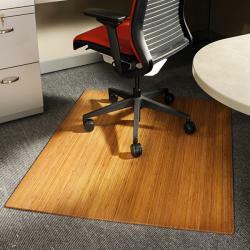 A modern chair mat will improve the functionality and mobility of your office chair will making your space look great! Brands like Anji Mountain offer bamboo floor mats that should be considered for every office makeover project. Up for a little DIY project? Custom floor mats can be easily made to go under office desks, reception desks, and even conference tables as area rug alternatives! The industrial look is in! This year, interior designers are making regular visits to salvage yards, flea markets, and thrift stores to find retro lighting to utilize in office makeover projects. 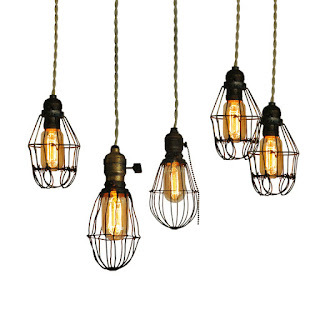 Cool metal lamps and lighting features put of a vintage vibe that's hard to miss. 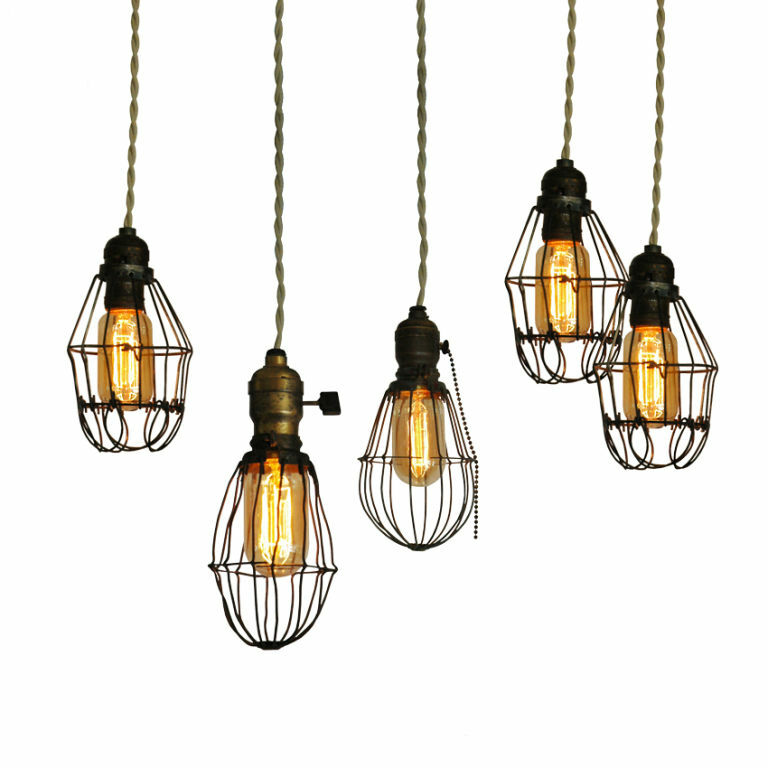 Use industrial lighting fixtures in the executive office, conference room, and lobby to show your design skills! Let your individual personality shine by adding a cool piece of wall art to your workspace. While you're at the thrift stores and flea markets, keep you eyes open for inspiring pieces that will enhance your space. If you don't have luck there, don't be afraid to visit home decor store. Framed art can often be found on sale and won't break your budget. 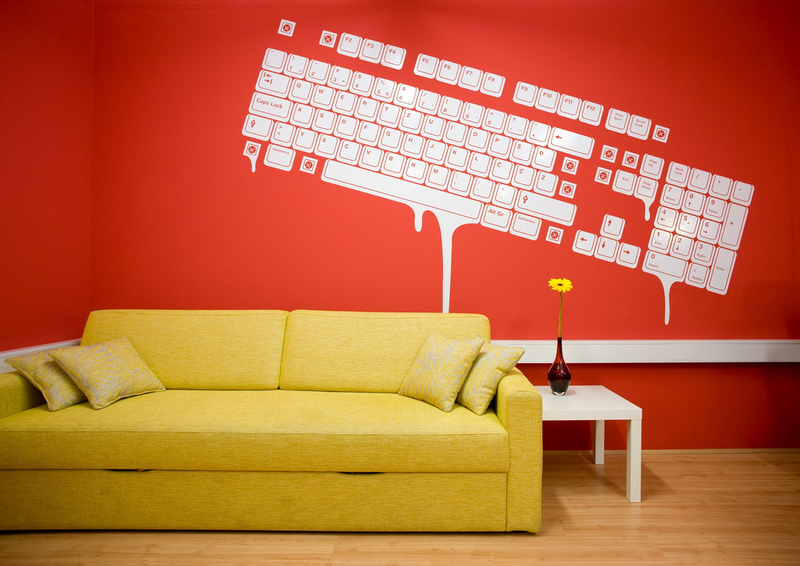 Don't let your office walls be bare and boring. Spice them up with a cool portrait or landscape painting. Add a little greenery to your office interiors with hanging plants. You can pick up cools vases and pots at any local home store. Be sure to choose Spider Plants, Golden Pothos, Chrysanthemums, and other good indoor varieties. 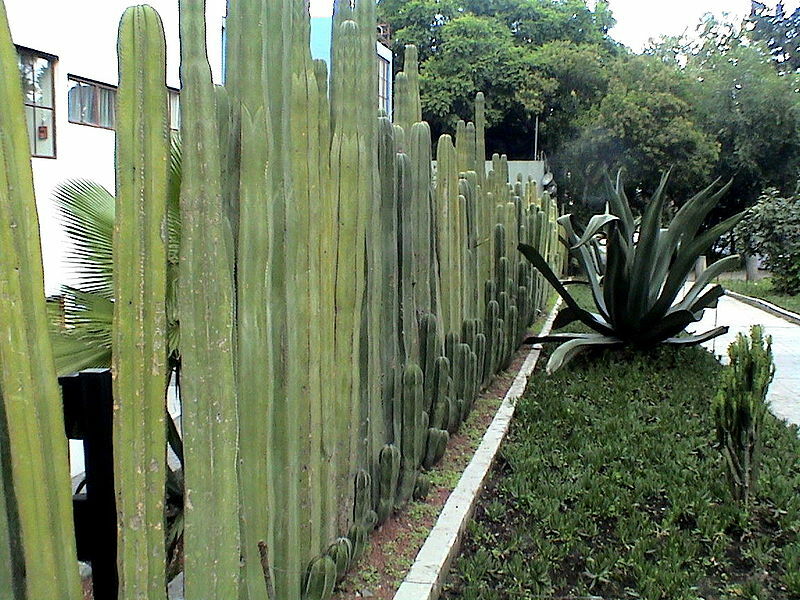 These awesome plants will actually improve the air quality of your space. Simply screw in a hook and accent the corners of your office with a new hanging plant. Don't' forget to water! No office can operate a peak performance levels without being well organized. That being said, traditional storage cabinets take up a ton of floor space that most of us don't have! New and innovative options like storage benches are great for multiple purposes and are in turn far better options. Don't let your floor space go to waste! In your quest to create the perfect work environment, consider ways to maximize your square footage without sacrificing square footage. Wall mount hutch units are another great option that will accent your room without making your space feel overcrowded. Mobilized desk pedestals with cushioned tops are also popular options in 2015. Use them as a stool as well as a handy place to keep important documents secure. That's sounds a lot better than the traditional metal file cabinets we are all used to seeing! The summer season has brought with it awesome new office chairs for both home and business applications! In today's post we'll take a look at our 10 favorite chairs and their ergonomic benefits. Enjoy! The all new Curva chair from the Cherryman iDesk seating collection offers visual appeal and the ergonomic features to match. Available in two back heights and two frame finish options, the Curva is ready to take executive office interiors and conference rooms to the next level! 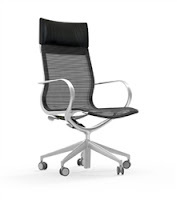 The team at Eurotech Seating has really outdone themselves with the new iOO chair. 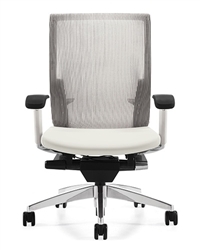 These modern mesh back taskers combine form and function to provide the ultimate sitting experience. Choose from all black and black on white models with optional headrests. Ergo Contract Furniture has stepped up their seating game in a major way with the new Layover chair. This high end mesh seating solution is available in 7 cool color options at a price point any shopper will appreciate. Layover tasking chairs come standard with a 2 to 1 syncro tilt mechanism, tilt tension control, and adjustable arms for just $267.99. Perfect for lobby, waiting room, and training environments, the new Lite chairs from Global Total Office offer unmatched versatility. 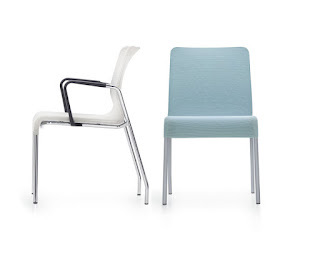 Available in both mesh and fully upholstered options, Lite chairs can be spec'd with or without arms and casters. Choose from an amazing 24 mesh color options, 3 frame finishes, and two base styles to make your interiors one of a kind. Another addition from Cherryman's iDesk seating collection, the Oroblanco chair has been making waves since the beginning of 2015. These fully functional computer chairs are perfect for both home and professional business applications. Choose from a variety of cool color options that all ship within 3 days of purchase! With the recent success of Mayline's new Medina furniture collection, you might have missed the release of the Gist chair! 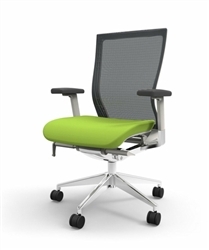 These mesh back tasking models offer an awesome ergonomic package at an everyday low price. While most of the top ergo chairs cost well over five hundred bucks, the Gist can be yours in a variety of cool colors for just $281.99. The Creedence chair from Woodstock Marketing was a no brainer for today's list. 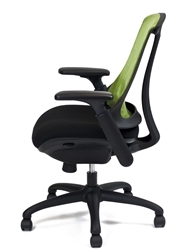 These elegant office chairs offer sleek curves and high end adjustable features. Woodstock Marketing is always ahead of the design curve, and with the trend setting Creedence chair they've got another hit on their hands! 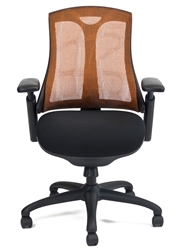 As mesh back office chairs have dominated the market in 2015, it's been harder for leather executive models to make their mark on the industry. That being said, Eurotech has done it with the swanky new Frasso chair. These upscale executive swivel chairs are incredibly comfortable, incredible versatile, and incredibly user friendly. Shoppers up against a tight budget will have a hard time finding an all around better office chair than the OTG10902B. 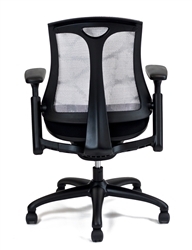 This professional quality mesh back office chair from Offices To Go was released just a few short weeks ago. 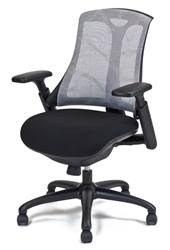 The OTG10902B features a gray mesh back with thick padded seat and black nylon features. At just $110.99, you'll quickly see why we love these new chairs! Plug into the new Circuit chair from Ergo Contract Furniture and enjoy! These trendy mesh back chairs offer a side seat and back design that's sure to keep larger chair operators comfy. The white frame and gray mesh combo provides an upscale look that's sure to impress even the harshest critics. Not all office chairs are created equal! And once you see the new G20 cloud chair in person, you'll certainly agree! If you're looking for wow factor, the G20 Cloud has it. If you're looking for cutting edge ergonomic features, it's got that too. Color options, no problem! These chairs do it all! Most home workers would agree, not being bound by the walls of a cubicle or a boss over your shoulder is pretty great! Still, it's hard to get things done when you're physically uncomfortable. Whether you work in a town house or a skyscraper, staying healthy is always a challenge in any office. Thankfully, today's article is all about the best tricks to help you live a healthier, more comfortable, ergonomic office life at home! Whether it's your desk or a pair of pants, finding the perfect fit is always important. When it comes to office workstations, nothing takes greater precedence than how it's adjusted. This may sound strange, but improperly adjusted workstations are actually one of the most common causes of office-related pain. In fact, back pain, neck pain, leg pain, muscular trouble, and even poor blood flow can all be potential results when the desk height and chair height are disproportionate to the user's needs. But don't stop there! While you're adjusting features, make sure you're happy with the layout of the workstation in the room. Sometimes a simple window view is the quickest cure for the Monday Blues! Believe it or not, comfort in the office is almost solely dependent upon proper posture. Adjust your workstation to your body's dimensions by first sitting up straight in your office chair. Knees should be bent at right angles, with feet flat on the floor to prevent loss of circulation in the legs. Next, keep elbows bent at right angles, with forearms parallel to wrists and hands - this should be the location of keyboard platforms or desktops (depending on which one your hands interact with more). Finally, ensure the top of your computer monitor is at eye level, when your head is face forward and upright as when standing or walking - this prevents neck and upper back pain. Any fashionista will tell you, "always accessorize!" And the same is true for interior design. In the case of home office furniture, however, accessories are much more than some simple decorations. When you shop ergonomic office products, you are shopping for actual tools, many of which are backed by years of study and technological innovation. Ergo tools like monitor arms for computers can drastically improve one's quality of life in the workplace simply by reducing pain. In addition, they also save space and improve efficiency. Accessories like lumbar supports, desk lamps, and even foot rests can go a long way in turning a low tech work zone into an executive paradise! One of the most prominent reasons office workers experience chronic pain or fatigue is lack of movement. Even working at home has its drawbacks in a sedentary lifestyle - but it doesn't have to be! Finding ways to stay active and healthy at work is a strategy that's got office workers everywhere going crazy - and the newest health trend is... deskercise! Health experts have set creative sights on making the average cubicle into a modern gym. The internet is riddled with tutorials and videos that discuss proper ways to exercise on the job. After all, you're at home - why not make the most of it with a few stretches and leg lifts to stay active? One of the most effective ways to live an ergonomic life - take breaks. While many office workers strive to plow through the day as fast as possible, this is actually an extremely unhealthy way to live. The body needs activity and the brain needs breaks. Although working from home certainly isn't a cakewalk, in most cases, it does offer the blessing of actually allowing you to physically walk. If you're graced with the freedom of not having a boss breathe down your neck, take advantage of it. There are multiple studies out there showing the benefits of frequent active breaks on the human brain. Not only does focus improve, but so does energy. 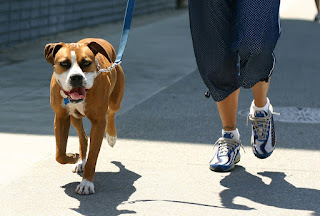 So leave the desk chairs behind and go walk the dog. Your body and mind (and work) will thank you! Known for their innovative products designed to improve workplace functionality and efficiency, Ergo Contract Furniture has a home run on their hands with the new Layover mesh office seating collection. In today's chair of the week post we'll take a look at the new Layover chair and it's awesome features. Enjoy! Modern in every way, the Layover chair by Ergo Contract furniture is sure to impress even the harshest critics. With a unique mesh back design and cutting edge contours, these new chairs are ready to earn your office space the compliments it deserves. 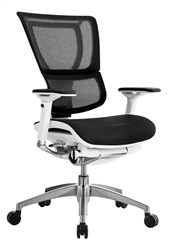 The ergonomic features are what set the Layover apart from most of the comparable task chairs on the market. 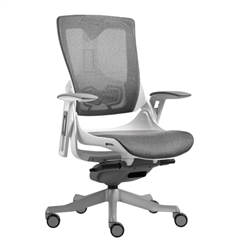 The separated chair back bone allows the mesh back to flex and provide a more comfortable sitting experience for the user. In addition. 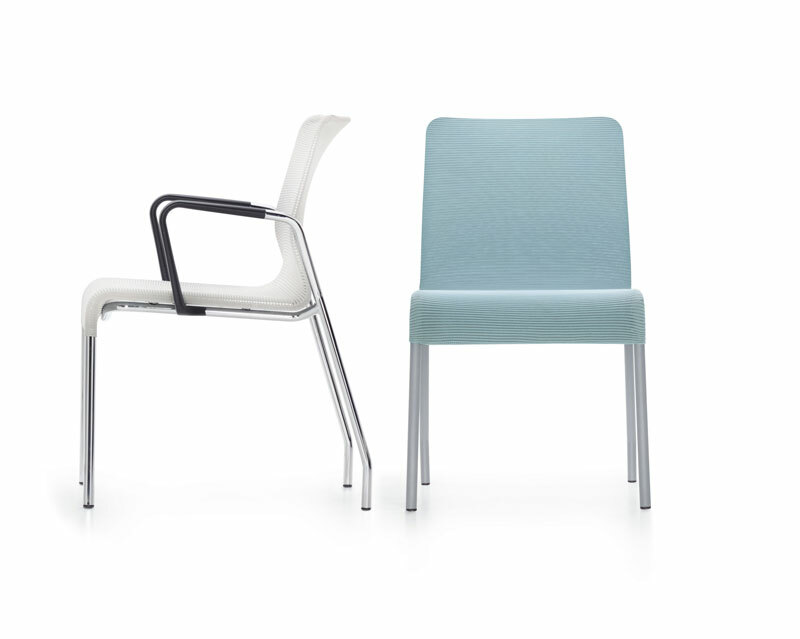 the chair spine also features an integrated handle to make movement easy when necessary. The Layover chair boasts a full enclosed mechanism that's equipped with easy to operate button adjustments. A 2 to 1 syncro tilt passive mechanism, tilt tension control, 3 position lock out, and adjustable arms are all standard! 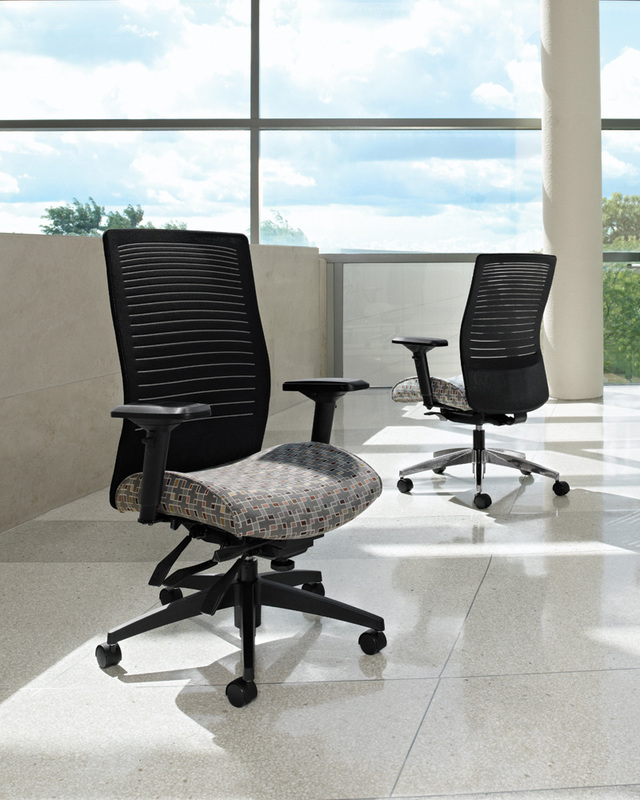 The extra thick molded foam seat features a waterfall edge to take pressure off the knees and make those long days at the office a breeze. All in all, the Layover is a complete ergonomic package! The Layover seating collection was introduced with 7 cool mesh color options that pair well with the standard black fabric seat. If you're looking to show a bit of personality and individual style, the apple green, scarlet, pumpkin, and copper shimmer options are the way to go. Want to keep it a bit more simple? No problem! Slate gray, snow, and all black options are also available. It's hard to believe these awesome new computer chairs from Ergo Contract Furniture are available for just $267.99. 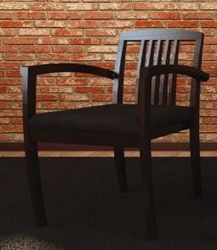 At this price point, you'd be hard pressed to find a chair this good at nearly three times cost. All the colors, all the features, and everything that make the layover a great buy in a full package for well below three hundred bucks. What could be better? We give the Layover 5 out of 5 stars. While we'd like to see an optional leather seat upgrade for executive applications, there's really not much to critique about these trendy new chairs. The Layover combines form and function to create one of the best office chairs of 2015.